Interflora, the flower experts, have undergone a major re-branding which has meant changes throughout all their customer touch points, online, in store and on the road to communicate the new exciting Interflora brand. Interflora are the world leaders in flower delivery with 58,000 shops worldwide in their network. This new branding needed to be transferred to the Interflora members’ vehicles which are on the road, communicating the Interflora brand message all day every day. Research has shown that the average branded vehicle gains 9000 views or impressions per hour. This means that the Interflora fleet is seen by many millions of people every day, which is why getting the branding right on their vans is so important. The problem Interflora faced is that many of their vans were not black, (which is the background colour of the Interflora branding) and most of the vans were in the middle of lease agreements which meant buying new black vans was not practical. The colour of the van however is obviously critical to the new branding. To paraphrase Henry Ford…“the Interflora vans can be any colour, so long as they are black”. 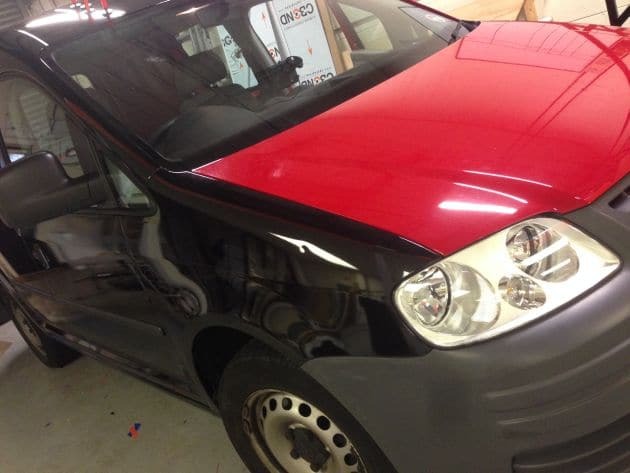 With PVL’s expertise in vehicle wrapping, we were able to advise of the ideal black wrapping vinyl to use to wrap their existing non-black vans (many other black wrapping vinyls do not give such a perfect finish leaving visible marks on the vinyl). PVL’s experienced fitting teams then fully wrap any colour van and apply the Interflora branding on top, throughout the UK. This has allowed the Interflora members to use their existing vans without having to purchase black ones. By wrapping, for example, a white van in black vinyl, it also gives the owner the added benefit of being able to easily remove the wrap when they wish to sell it or return the vehicle at the end of the lease. This avoids having to re-spray the vehicle and a white van gives a better resale value than a van of any other colour. An example is shown below of how we wrapped a red van and transformed it into an Interflora branded, black van. As PVL are a nationwide re-branding specialist we carry out the van wrapping and re-branding of the Interflora vans throughout the UK. The result of the re-branding has been received really well by the all the Interflora members and their customers. As Anita Hemblade, the owner of Wendy Kelly Flowers shop in Brighton said when they received their “new” black wrapped branded van “We love the result of the wrap. Our customers think it looks great and they can’t believe that it has been wrapped and not painted“.